We are one of the largest Exporters, Importers and Suppliers of Endo Kogyo Equipment. Our range of diverse Endo Kogyo Equipment consists of Air Balancer, Air Hoists, Spring Balancer and Tool Hose Balancer. There are numerous models of mentioned Endo Kogyo Equipment, which are endowed with different features. Endo Kogyo Equipment bought by us from the company is of superior quality. We also provide wholesale offer of Endo Kogyo Equipment. You can easily buy any of our Endo Kogyo Equipment at reasonable prices. Air Hoist supplied by us helps in reducing workerâ��s fatigue and increases workers efficiency. With the help of Air Hoist one can easily do heavy material lifting. Air Hoist requires only air motor for its working. 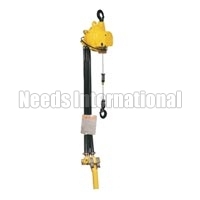 Moreover, our Air Hoist does not require electric motor and works with intense stepless speed control.